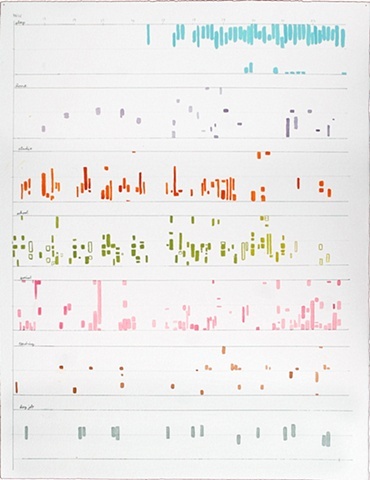 In this piece I extracted seven categories of activity from my digital schedule and notated them in watercolor into an instrumental score for an atonal sound piece. The transcription corresponds the number of hours in a day to the number of half notes in the treble and bass clef scales, and the 7/8 time signature to the number of days in a week. This piece was a collaboration with Sarah Phillips. Click on the last thumbnail of this series to hear the audio piece.